The first idea that enables a Sun Level Education is correctly defining the role of parents. 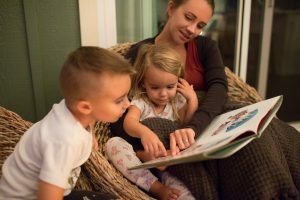 At American Family Education, we believe family is the most important unit of community and that parents should be the primary influencers of their own children. Children are not born to governments or schools; they are born to parents. It is the parent’s right and responsibility to oversee the education of their children. It is inappropriate for any third party outside the family (government, school, or individual) to control or coerce the family unit. However, just because this responsibility rests upon the parent’s shoulders does not mean that parents must educate their children alone. Parents have the right to enlist the help of teachers, mentors, field experts, and anyone who they deem qualified to assist them and their children along their path. The problem we face today is that giving our parental stewardship away has become convenient, free, and seen as normal. 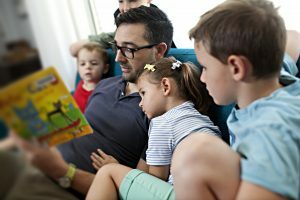 Until recently, the only real option for parents who want to take back the responsibility of educating their children has been homeschooling. This movement has been so important and the families that have sacrificed and fought for their right to educate their own children should be applauded. In fact, we believe that having a homeschooling type mentality (meaning that you have completely accepted the responsibility for the education of your children) is one of the most important shifts parents must make in order for their children to be successful at AFE. Many parents feel overwhelmed by this idea. It does seem daunting at first, but it is simpler than it sounds. We hear from many parents that they could never be responsible for their child’s education or mentor their children because there is so much tension and impatience in their relationship. But what we don’t often realize is that our difficult relationships are actually a symptom of a much bigger issue. When we send our children away all day, every day, their attachment to us is stressed and they learn to be more emotionally dependent on friends and other adults than on us, their parents–the ones who are actually responsible for them. Children cooperate with, behave well for, and become like those who they are emotionally attached to. So when our children’s peers or teachers begin to replace us, our children become difficult for us to influence, guide, and teach. The answer to all of this is not to have our children around us less, but rather a deeper level of emotional attachment between parent and child. So how can we reattach to our children and find the peace in our relationships that will enable us to lead them in their education? For the answer to this question, we’d like to introduce you to Dr.Gordon Neufeld. His research into child-parent attachment has been a powerful influence for the way we have build American Family Education. The ideas presented in the resources that follow have been curated to help you understand and deepen parent-child relationships. If this information has been helpful to you, we would highly recommend reading Dr. Neufeld’s book, “Hold on to Your Kids. 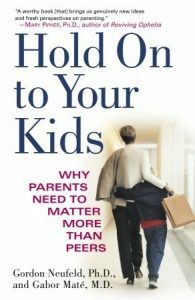 Why Parents Need to Matter More than Peers.” In this book Dr. Neufeld explains how all of these issues directly effect education. If you are a new AFE parent, consider this book your first step on the path towards a new family culture that will support Self-Directed, Agency-Based Education. Another wonderful tool for understanding attachment in children and applying the principles taught by Dr. Neufeld is a book by Deborah MacNamera called, “Rest, Play, Grow. 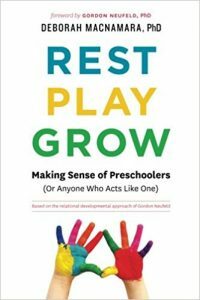 Making Sense of Preschoolers (or anyone who acts like one).“ This is a real hands on guide to understanding what our children need from us. 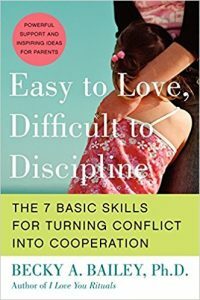 Another great resource is Dr.Becky Bailey’s “Easy to Love, Difficult to Discipline: The 7 Basic Skills for Turning Conflict into Cooperation” This is a wonderful guide to more peaceful relationships in our families. Instead of focusing on easy “bandaid” type fixes to control child behavior, this book lays out a path to becoming your best self as an adult, managing your own emotions, and helping children develop higher level brain function. Dr. Bailey has a comprehensive approach to discipline that AFE utilizes in the classroom. This program is called Conscious Discipline.